Arthur Shepherd is, for me, one of those names at the periphery. I seem to recall having heard some of his songs in a BBC Radio 3 broadcast but they did not register at all strongly. No surprises there as at that time I was far more interested in the orchestral music of the Americans of the 1920s to 1950s. Tantara Records was established with an endowment to record the works of Latter-Day Saint composers. The 'most prominent' Mormon composer is Leroy Robertson (and I review the Tantara CD of Robertson elsewhere). Shepherd takes a different route from Robertson. Where Robertson's very considerable strengths lie in romantica, Shepherd can draw on a much more oblique approach. Pianist, conductor, writer and teacher, he was born in Paris, Idaho. In turns he illuminated the academic and musical lives of three American cities: Salt Lake City, Boston and Cleveland. He revived the Salt Lake City SO (later to become the Utah SO), in 1910 he moved to Cleveland and after war service he uprooted to Cleveland. His Ouverture Joyeuse won the Paderewski Prize. In 1926 came his Horizons (a three movement orchestral work). He counted these works among his most important alongside the Triptych for soprano and string quartet (1925), the violin sonata (1916-1920 - a work about which I am very curious as it may well reflect his Great war experiences in 1918) and the only chamber work on this disc, the Piano Quintet. 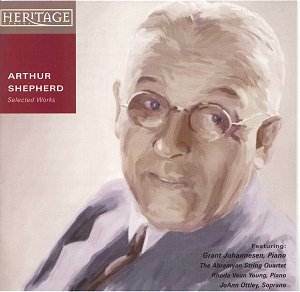 Shepherd's oblique approach is rife in the Piano Quintet. The work is determinedly Bartókian with a serious and heroic first movement which at the close finds refuge in beauty. The central movement is a dark eclogue (rather similar to Bartok Piano Concerto No. 1). The finale achieves more repose, being songful (at 1.45 over a densely decorated harmonic gauze) with a nicely resiny fugue (3.29). The passionate tone of the cello and (at 5.40) the solo violin achieve a moving simplicity of expression for which the other two movements do not prepare you. The work is not especially in American in feel. The premiere was given by the composer with the Roth Quartet at the 1941 Brigham Young University Summer Festival. The songs. Matin Song is an odd mix. You think it is going to be simple but soon the expressionism of early Schoenberg (think Gurrelieder and Das Buch Der Hangenden Gärten) enters. Austerity continues in the He Came All So Still but here we can also think of late Holst. Going back forty years The lost child (1908) is mellifluous, showing great concentration and integrity. Nocturn (1907) is so-so - fairly conventional. A year before that produced Solitude which can be liked to Frank Bridge in his coldest realms (from that point of view well ahead of its time). Where loveliness keeps house is an approachable summer idyll. Grant Johannesen (a name well known to record collectors) contributes the piano solos. The Two-Step (1939) is a sly, light jangle of notes, impressionistically loose of limb: Debussy out of Joplin out of Medtner. Exotic Dance No. 1 (1928) offers eastival shade - comfort deep and velvety. From a mountain lake is the longest of the four: musing impressions of bells, dankly clouded, leading to an andante placido in which Shepherd proves himself a spinner of high mountain magic. The Gigue is busy and even its softer finale is built of emotionally unyielding material. A recommended collection. I hope that Tantara are able to record Shepherd's other music. I would like to hear all the works listed above. There are four string quartets (1933-55), two symphonies (1927 and 1938), a violin concerto and many other choral and orchestral works.